An accent headboard often makes the focal point of a bedroom and sometimes even defines the entire decor. If you choose to go that way, you need a headboard that really makes a statement. Cheap default options aren’t the best choice. If you’re a crafter, you will of course want a headboard that you can DIY and build a unique feature for your bedroom decor that way. For instance, it can be in a rustic style made of wood, or upholstered, tufted and made of fabric, or perhaps even made of repurposed materials. 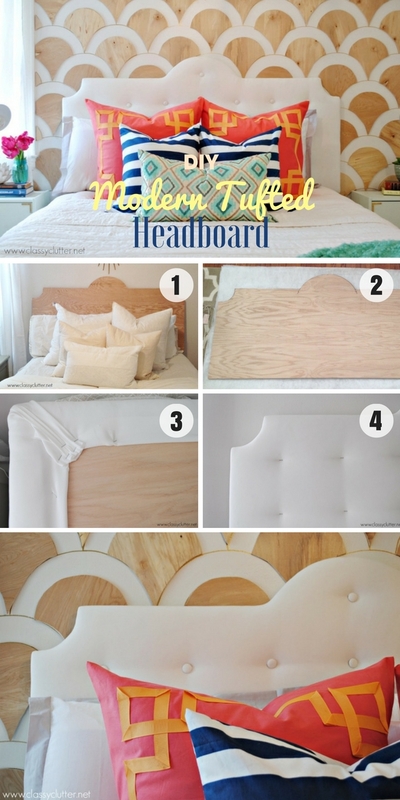 In any case, here are 8 easy DIY headboard ideas that you will enjoy. This DIY headboard idea is quite a classic. Everyone loves rustic decor and having one as a focal point in your bedroom is a terrific option. It dictates a very warm decor style and the light sconces that match the style are wonderful accents. If you want a simple and easy option, this fabric headboard will be perfect for you. All it takes is a simple wooden frame and a piece of fabric of your choice to build a beautiful decor accent for your bedroom. When it comes to DIY rustic decor, pallet wood is the go to material, so it’s no wonder we find it in this list. This is a great rustic headboard with an uneven edge which creates a lot of charm. Light fixtures make a great functional addition. If you were to buy one, a tufted headboard is a popular option, if a bit pricey. You can make one for pennies if you’re willing to spend a few hours upholstering a wooden frame yourself. Repurposing old window frames is not only a way to make use of cheap materials, it creates a great whimsical accent in your bedroom decor too. It’s one of those unique ideas you have to try at home. A DIY headboard doesn’t always have to be rustic – perhaps you don’t want to use that style in your decor at all. Here’s an idea for a modern style tufted headboard which is fairly easy to make as well. 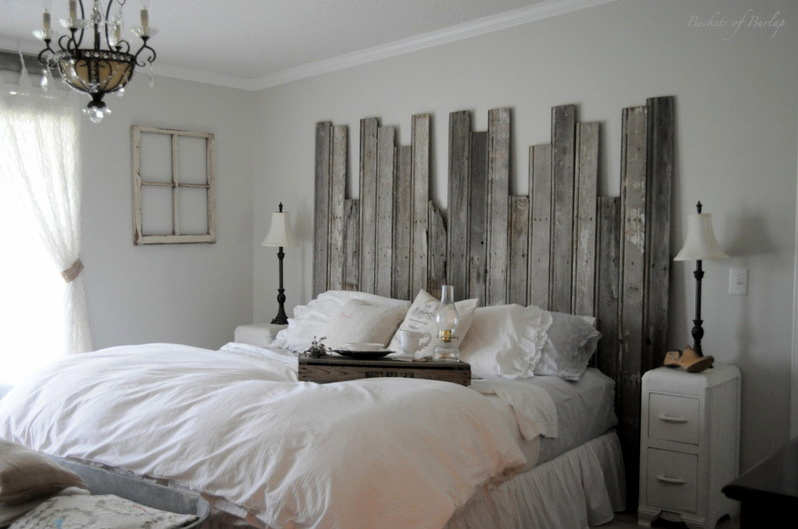 Going back to rustic bedroom decor, a barn door headboard is another popular option. It’s a bit more complicated to build than most of the others on the list, but its still fairly easy. The end result is guaranteed to pop and bring the whole decor together. This headboard idea is one of the most intricate as it combines a couple of styles and functions. First, it has a white washed rustic frame with beautiful corbel details and a shelf for display. Then it has an upholstered main part of the headboard. Truly, a wonderful design.